I finally made the big stage. Thanks to Eddie Hearn. I was wondering how such a young guy got to run such a big company and I found out you got a little help from your dad. You’ve got to give credit where credit is due and he is taking Matchroom boxing to the next level and because of Eddie Hearn who has grown boxing in Europe and in the UK and has got people watching and because of that people will get to watch me shock Daniel Jacobs. People are saying that I’m rubbing people the wrong way by being disrespectful, but how am I being disrespectful? It facts – everything I have said I backed it up with a fact. I said it a little loud but it was a fact. Did he or did he not get knocked out? Has be been dropped? He has – multiple people have put him down. You’re looking at this fight by the names. Take away the names and take away the stories and simply look a the facts – he’s been hurt, he’s been dropped and he’s been knocked out. I haven’t bee n hurt, I haven’t been dropped, I’ve been fighting bigger guys my whole career and I’m ready for this fight. Like I said, I put the work in, I’ve done everything I’ve needed to do, I am physically ready, I’m mentally ready and I’m ready to shock the world. On November 11, Danny Jacobs is in a very tough fight and he’s going to find that out right away so I’m ready and I’ll see you guys Saturday night. Thank you Luis and thank you for the kind words. Like you said facts, yea. I was born with a Silver spoon in my mouth, OK, but I did turn it Gold. This guy has been speaking for the both of us. This is going to be a stellar fight. At the end of the day it’s about two guys coming to the center of the ring and fighting. Talk outside the ring is good for promo but you guys are going to soon find out there are levels to this game inside the ring come November 11. I don’t know if you guys have heard but I’m from Brownsville and I have never run, I never ran and I never will. So this whole notion of me running and not fighting the fight that he wants me to fight. He’s very limited in the ring. He wants me to stand inside the center of the ring and “don’t run” so he thinks he can have the shot to stop me or drop me or knock me out. But I’m going to make you work for everything you get. Then when I am redy to stand in the middle of the ring, if I choose to do that, that’s what I’ll do. I want to thank the fans because at the end of the day it’s about the fans who spend their hard earned money to support us making sure that we do our due diligence to make a good fight, because this man can fight, no doubt about it. It’s going to be a great card and I am looking forward to displaying my skills on my new home, HBO. It’s a great platform for me – no added pressure and trust me, this is not my first rodeo. It’s going to be a special night and I want to thank Arias’ team for stepping up to the plate, because when I got a list of opponents I chose Arias so I do want to thank him for signing the contract. There is an opening right now and this gives me a big chance for the future. This will be a brutal fight with a lot of blood and let the best man win. All I can say is this – I haven’t ate a cheeseburger in two months. I am going to kick his behind. Big shout out to Mike who has been in camp every day cooking breakfast and making sure I have no snicker in my bag and no cheeseburgers. It was a phenomenal camp. Every camp has its ups and downs and it was one of those camps where we had to push through. I definitely dropped some weight – you’ll see the number tomorrow. I feel amazing, I feel awesome and I feel blessed. It’s been a long road – I started my career at 14. I turned pro kickboxing at 18 and boxing at 19 and it has not been easy. I have not been given a silver spoon, no Olympics or none of that stuff – I have earned every inch by grit, blood, so if anyone tells you this is luck there is no such thing as luck – from Bed Stuy Brooklyn to here no luck, I just keep throwing punches. I am going to stop Wach. Wach is going to get his behind Wached. He’s kind of a lovable guy, his speech is kind of cute, but it’s going to be phenomenal – its going to be fireworks. I love Riddick Bowe, I love Mike Tyson and I love Shannon Briggs and now it’s time to love Big Baby. I my God, I have finally graduated. I have put on so many shows at the Paramount, more than anybody ever has and now I am graduating to the Nassau Veterans Memorial Coliseum and you know I’ll be wearing my red, white and blue bandana in respect to all of the troupes. If you didn’t know I am the Long Islander that has been raising havoc on Long Island for the past six years of my career and Pete Brodsky and his disciples here train me on Long Island and in West Palm Beach, Florida. Star Boxing brought me up – no one wanted me – they brought me up and made me into the powerhouse that I am now. You guys are going to see plenty of me for the next five years. I hope you guys are going to enjoy what you get on Saturday against Ortiz who fights a tough Mexican style. I am going to wear him down and take him out within five rounds. I have always done it. I have always taken out guys that I said I would. I am very proud and honored to be part of this entire event. So thank you and see you Saturday at 10 pm ET. Cletus, just to let you know, after those five years, you can have a job with Matchroom Boxing USA, 100%. Characters and personalities is what we need in this sport of boxing and there is one right there and boy can he fight as well. Thank you everyone. I know this fight is great for my career – I am very prepared and focused for a war. 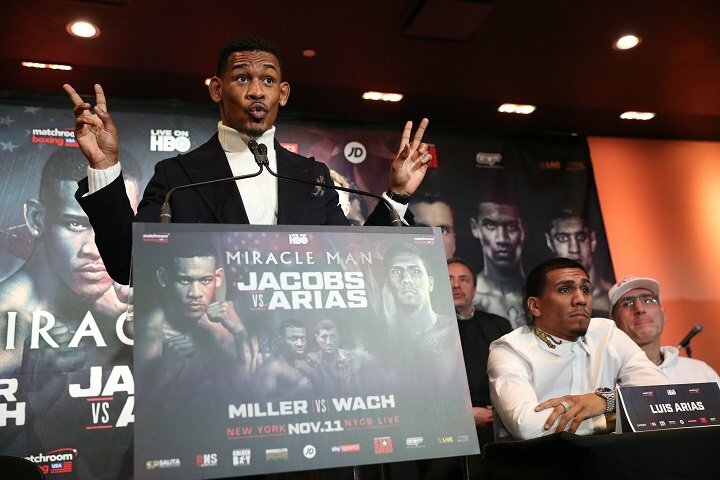 You are here: Home / Boxing News / Jacobs vs. Arias final quotes for Sat.